This April, CESR actively participated in the Spring Meetings of the International Monetary Fund (IMF) and the World Bank in Washington, DC. In meetings with senior IMF officials, the CESR delegation shared its research on the human rights impacts of austerity in countries like Brazil, Peru, Spain and Egypt, and challenged the IMF to end its support for particularly harmful fiscal consolidation measures. With partners, CESR’s team also sought to bolster efforts within the IMF to boost governments’ fiscal and policy space to fight gender and economic inequality, and to uphold human rights in times of economic stagnation. As an intergovernmental organization with key influence over how states prevent and resolve economic crises, the IMF has increasingly become the focus of CESR’s advocacy on the human rights impacts of austerity. Despite strong rhetoric from its leadership and supporting empirical evidence from its research team about the importance of tackling inequality, the IMF continues to offer policy advice (such as in Brazil) that further entrenches social and economic disparity with particularly harmful forms of fiscal adjustment. This year’s Spring Meetings events were an important part of a series CESR is organizing throughout 2018 to assess and address the frequently hidden costs for equality and human rights of the past “Lost Decade”since the global financial crisis, and to learn lessons to prevent another. In this context, CESR—together with the International Labour Organization (ILO) and the Bretton Woods Project—organized an interactive dialogue panel discussion, “A Lost Decade for Equality, Development and Human Rights?” to reflect on the political, economic and social implications of the 2008 economic crisis, to derive lessons learned and to explore viable alternatives to austerity. Featuring a cross-section of civil society, government, ILO and IMF officials, this well-attended session began with an introduction by the moderator, CESR’s Niko Lusiani, who shared challenges and forward-looking lessons learned from several years monitoring fiscal adjustment in countries in very different contexts—from Spain to Brazil, Egypt to Ireland and Colombia. Isabel Ortiz, the ILO’s Director of Social Protection and a widely-cited expert on fiscal consolidation and fiscal space, examined the fiscal fallout from the economic crisis ten years ago. She suggested alternative policies for boosting fiscal budgetary space, such as increasing progressive tax revenues and eliminating illicit financial flows. Grazielle David, Policy Advisor at the Institute for Socioeconomic Studies (INESC) in Brazil, shared the findings of a collaborative research project with CESR and Oxfam Brasil exploring the health, food security and gender impacts of Brazil’s twenty year freeze on real public spending. Grazielle cited progressive income and capital taxation, and the elimination of tax benefits and tax evasion, as more rights-affirming solutions to the debt crisis—all policies the IMF supported in statements made earlier this year. She questioned the IMF’s contradictory messaging around austerity in Brazil. Mark Weisbrot, Co-Director of the Center for Economic and Policy Research (CEPR) provided a dissection of the political economy of austerity, arguing that the Euro area crisis of 2011-2012 was taken as an opportunity to push for generally unpopular fiscal, labor market, social, and other reforms. He claimed that while the Fund has made some positive changes, it still tends to support spending reductions and government shrinkage, regardless of whether these were appropriate or economically necessary. Gudmundur Árnason, Permanent Secretary of the Ministry of Finance, Iceland shared lessons learned while serving in his position since 2009, in what has become a positive example of a human rights economic recovery. He discussed the creation of Iceland’s foundational “social stability pact,” which put maintaining public trust at the heart of its fiscal recovery. Social spending was safeguarded against potentially harmful budget cuts, a wealth tax was introduced and the progressive income tax structure was steepened. Due to these and other measures, and with the IMF’s support, Iceland managed to get new banks operating within a year while inequality actually decreased during the crisis. Jeffrey Franks, Director of the IMF Europe Office, shared some of the Fund’s current thinking on fiscal policies, especially on the importance of pursuing fiscal adjustment during a downturn while protecting social expenditure. Jeffrey acknowledged that the global financial crisis has caused many countries to experience a Lost Decade, with below-trend GDP per capita and rising poverty and inequality. He shared how the Fund has for some time now taken a broader approach to economic policy—moving beyond merely macroeconomic considerations to consider also issues of gender, inequality, and climate change that can be relevant to reach better economic outcomes for society. During the Spring Meetings, CESR also had an opportunity to share its work in Egypt with representatives of the IMF, World Bank, and civil society. In Egypt, CESR is working with civil society groups to investigate how fiscal austerity and other macroeconomic reforms undertaken in recent years—enacted in conjunction with an IMF loan and carried out through World Bank technical assistance programs—have affected economic and social rights. A particular concern is that these effects are not being captured by the narrow set of economic indicators used by international financial institutions and the government. In response, CESR and its partners have been developing a complementary set of social progress indicators that take into account Egypt’s human rights and development commitments and offer a practical tool for more holistic evidence-based policymaking. CESR shared its concerns about developments in Egypt through bilateral meetings with high-level IMF officials, as well as through participation in broader discussions. The first, organized by the Arab NGO Network for Development, looked at economic transition, inequality and IMF policies in Lebanon, Egypt and Jordan. 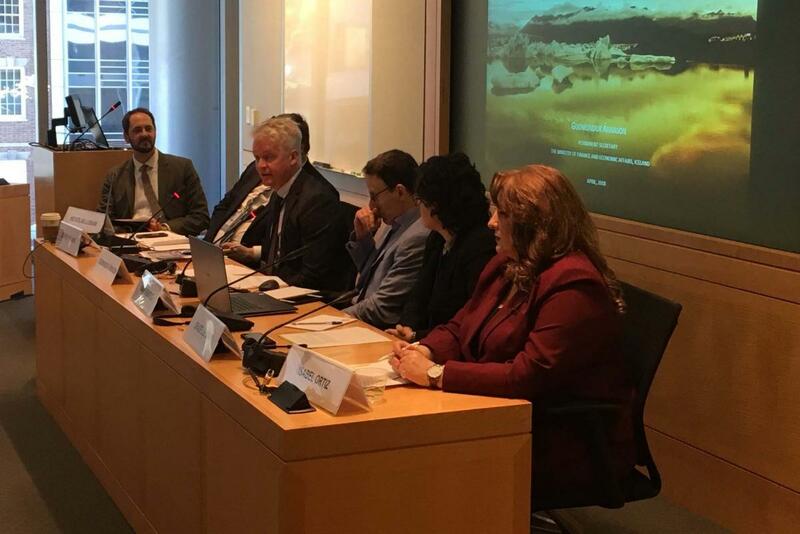 The second, organized by the MENA Coalition on International Financial Institutions, discussed the implementation of the World Bank and IMF’s information disclosure policies. In both panels, the challenge of information gaps was raised, in particular on the social impacts of loans. The lack of information on such effects leads to a partial picture of “success” that overlooks the damaging effects of economic reform. CESR also co-hosted an evening discussion, where civil society groups engaged in a lively debate about the effects of and alternatives to the various austerity-style reforms accompanying the IMF’s loan to Egypt. Moving ahead, CESR will continue to be vigilant in monitoring the IMF’s role in this age of austerity—encouraging the Fund to take the high road by using its significant influence for more sufficient, equitable and accountable fiscal policies to prevent another Lost Decade.